Assam Rifles Tradesman Previous Question Papers: Assam Rifles Technical and Tradesman Previous Year Question Papers are available for download now. 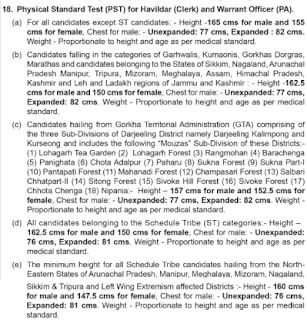 Candidates who are applied for Assam Rifles Tradesman Jobs can download the files in PDF using the below links. Candidates have to efficiently use the previous papers and model papers to get qualified in Assam Rifles Technical Tradesman Entrance Exam. Candidates can collect the Assam Rifles Tradesman Previous Question Papers here. Also, the Technical and Tradesman syllabus and Exam Pattern is available here for the sake of Job Aspirants. Candidates are advised to include "Assam Rifles Tradesman Previous Question Papers" in their preparation for better results. 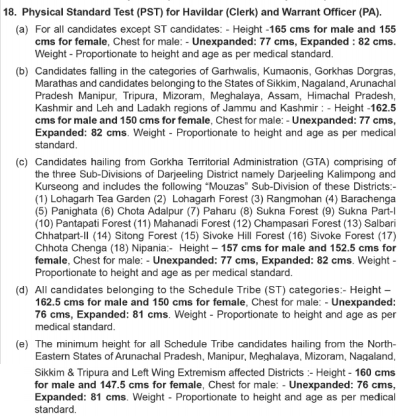 Assam Rifles Technical Tradesman Exam Pattern. Based on the marks obtained in the above Tests, Merit list will be designed. Physical Standard Test (PST): The physical test is not the same for all the trades. The height and chest measurements for the Tradesman is as shown in the figure. Click on the side by side Images to view in extra zoom for good quality. Also, check the Exam Pattern for Physical Eligibility Test (PET), Written Test, Trade Test, and Detailed Medical Examination in the below figures. The written test contains questions on General Awareness, Quantitative Aptitude, Reasoning, English, and respective trades. Check the below links to download Assam Rifles Tradesman Previous Year Question Papers.